The first meal of the day is a free-for-all for some and an afterthought for others. Here's your guide to making the perfect bodybuilder breakfast. Q. I'm confused about what I should eat for breakfast. What does the science say about the ideal macros for the morning? Perhaps more than any other meal, breakfast is at the mercy of our daily routine—or lack thereof. Even those of us who have heard that it's "the most important meal of the day"—i.e., all of us—can sometimes be found skipping it while we panic to get out the door. Or we'll dip doughnuts into coffee and assume it's better than nothing. Or we'll pack in large servings of whole grains in the hope that they'll give us "long-lasting energy throughout the day." "Breakfast can be geared strategically to assist your goals." I'm here to say that the aura around breakfast is well deserved, and that skipping it is bad news. Studies have found that people who don't eat breakfast tend to overeat during the rest of the day and have more body fat overall.1,2 In addition, research has shown that what you eat at breakfast determines how well your metabolism functions for the remainder of the day—for better and worse. As you might expect, then, breakfast can also be geared strategically to your goals. Since your goals include losing fat, building muscle, and achieving a healthy body composition, let's dig into the perfect macros for the morning. As you might expect, anabolism (protein synthesis) is at its lowest and catabolism (muscle breakdown) is greatest after an overnight fast.3 This is significant. Americans typically consume most of their protein at lunch and dinner, with only insignificant amounts at breakfast. Research has found a threshold amount of protein, 30-40 grams' worth, that must be consumed to both trigger muscle protein synthesis.4 This amount is far above what you'll get from a typical American breakfast of a bagel, cream cheese, and orange juice. Eat like that, and you set yourself up to remain in a catabolic state! 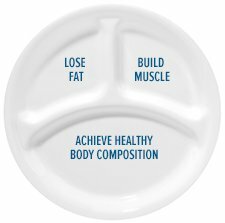 Aside from the anabolic benefits of protein, research has shown that consuming higher-protein breakfasts makes individuals feel fuller throughout the day, all while burning more fat than with lower amounts of protein.5,6 Accordingly, I recommend 30-40 g of high quality protein at the first meal of the day. The quality of the carbs you eat at breakfast seems to matter as much or more than the quantity, within reason. Your choices? Fast-digesting carbs in the form of sugars, starches, and flours; or slow-digesting fibrous carbs like oatmeal. Dr. Stevenson investigated this question by studying subjects who ate a fast-digesting or slow-digesting breakfast three hours before performing exercise7. Fat burning was 2-3 times higher in the slow-digesting carbohydrate than the fast-digesting meal. In addition, high-fiber, low-glycemic breakfasts can contribute to satiety over the course of the day8. Fast-digesting carbs, as their name implies, tend to leave you hankering for more of the same junk food far too soon. Do you think cutting back on trashy carbs in the morning means you skimp on fat too? Think again. Researchers from the University of Alabama at Birmingham performed a series of experiments where subjects were fed either a high-fat breakfast (45/35/20 percent fat, carbs, and protein), or a high-carb, low-fat breakfast (10/70/20). The high-fat breakfast was followed by eight hours of high-carb eating (10/70/20) while the high-carb breakfast was followed by eight hours of high-fat eating (45/35/20). This continued for 12 weeks. Astoundingly, even though the total macros were similar between groups, subjects who ate a high-fat breakfast burned more fat throughout the day, and they were leaner than the high-carb breakfast eaters! The takeaway is that breakfast programs your metabolism for the rest of the day. A high-carb breakfast will cause you to rely primarily on carbohydrates for energy the rest of the day, whereas a higher-fat, lower-carbohydrate breakfast will program your metabolism to run on fat. "Breakfast will program your metabolism for the remainder of the day." To halt catabolism, maximize muscle anabolism, and improve fullness for the rest of the day, I recommend you take in roughly 30-40 grams of high quality protein at breakfast from sources such as eggs and dairy. A large egg and a 6 oz container of whole-milk yogurt both contain around 6-8 grams, so do the math. Furthermore, a low-to-moderate amount (<30 grams) of low-glycemic carbs, and a higher percentage fats (about 20 grams, or 40-45 percent of the total breakfast calories), seems like the perfect balance to encourage a lean, muscular body composition. Affenito SG. Breakfast: a missed opportunity. Journal of the American Dietetic Association 2007, 107:565-569.
de Castro JM. The time of day and the proportions of macronutrients eaten are related to total daily food intake. The British Journal Of Nutrition 2007, 98:1077-1083. Garlick PJ, Clugston GA, Swick RW, Waterlow JC. Diurnal pattern of protein and energy metabolism in man. Am J Clin Nutr 1980, 33:1983-1986. Layman DK. Dietary Guidelines should reflect new understandings about adult protein needs. Nutrition & Metabolism 2009, 6:12. Layman DK. Protein quantity and quality at levels above the RDA improves adult weight loss. J Am Coll Nutr 2004, 23:631S-636S. Yang D, Liu Z, Yang H, Jue Y. Acute effects of high-protein versus normal-protein isocaloric meals on satiety and ghrelin. Eur J Nutr 2013. Stevenson EJ, Astbury NM, Simpson EJ, Taylor MA, Macdonald IA. Fat oxidation during exercise and satiety during recovery are increased following a low-glycemic index breakfast in sedentary women. J Nutr 2009, 139:890-897. Hamedani A, Akhavan T, Samra RA, Anderson GH. Reduced energy intake at breakfast is not compensated for at lunch if a high-insoluble-fiber cereal replaces a low-fiber cereal. Am J Clin Nutr 2009, 89:1343-1349. Bray MS, Tsai JY, Villegas-Montoya C, Boland BB, Blasier Z, Egbejimi O, Kueht M, Young ME. Time-of-day-dependent dietary fat consumption influences multiple cardiometabolic syndrome parameters in mice. Int J Obes (Lond) 2010, 34:1589-1598.